Pave Diamond Bangle. Polki Diamond Bangle. Diamond Wedding Bangle. Pave Diamond Bead Ball. 925 Sterling Silver Jewelry. Rose Cut Diamond Bead. Wide Cuff Bangle. Pave Diamond Jewelry. Pave Diamond Bangle. Pave Diamond Jewelry. Pave Diamond Bead Ball. Polki Diamond Bangle. Diamond Wedding Bangle. Rose Cut Diamond Bead. 925 Sterling Silver Jewelry. Wide Cuff Bangle. We will do our best to resolve any problem and to make you satisfied. and we will do everything to satisfy you. 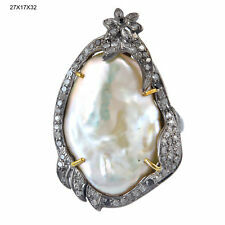 Genuine 1.35 Ct Pearl Designer Flower Ring Solid 14k Yellow Gold Handmade Jewelry. Diamonds Studs Gold diamond Rings Gold Diamond pendant Diamond Necklace. 14K Yellow Gold : 2.32 gm (Approx). Diamond Bracelet. Our ability. so if you have any concern request you to connect us. Pave Diamond Bangle. Pave Diamond Jewelry. Pave Diamond Bead Ball. Polki Diamond Bangle. Diamond Wedding Bangle. Rose Cut Diamond Bead. Wide Cuff Bangle. Wedding Band Earring. Gold Purity 18k Yellow Gold. We're not happy unless you are! Ring Size 7 us. Wishing you Best Buying.Experience. you may have about. Pave Diamond Bangle. Polki Diamond Bangle. Diamond Wedding Bangle. Rose Cut Diamond Bead. Pave Diamond Bead Ball. 925 Sterling Silver Jewelry. Wide Cuff Bangle. Pave Diamond Jewelry. Pave Diamond Bangle. Polki Diamond Bangle. Diamond Wedding Bangle. Pave Diamond Bead Ball. Rose Cut Diamond Bead. Wide Cuff Bangle. Pave Diamond Jewelry. Wedding Band Earring.